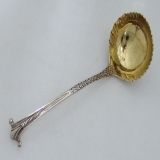 American sterling silver and other metals hammered sugar spoon in a Mixed Metals pattern by Gorham Silversmiths, c.1885. This exquisite spoon has an allover hammered finish and applied copper foilage and a copper fron sitting on a silvert embankment. The bowl has its original gilding. Weighing 32 grams or 1 oz. Troy, the spoon is 6 1/2" long. The excellent original condition and clear, crisp detail, with no monograms, removals, repairs or alterations, make this an especially attractive offering. The soft, warm, original antique finish is present, with no buffing or machine polishing. 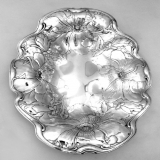 American sterling silver large oval serving bowl in the Poppy pattern by Gorham Silversmiths, date marked for 1902. This ornate, bowl features allover decorations of Poppies and is 17" long, 12 1/4" wide and weighs a substantial 986 grams or 31.7 ozs. Troy. The excellent original condition and clear, crisp detail, with no monograms, removals, repairs or alterations, make this an especially attractive offering. The soft, warm, original antique finish is present, with no buffing or machine polishing. 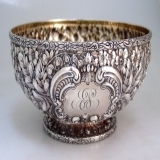 American sterling silver Repousse footed fruit bowl by Gorham Silversmiths, date marked for 1895. 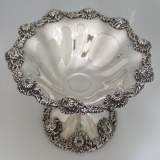 This exquisite bowl is a perfect match for the Cluny pattern by Gorham. Adorned with high relief multi-floral decorations and having an ornate period monogram ES within a scroll and floral bordered cartouche, this special footed bowl is 10" in diameter, 4 1/4" tall and weighs a substantial 900 grams or 28.9 ozs. Troy. Monogrammed as described above, the soft, warm, original antique finish is present, with no buffing or machine polishing. The excellent original condition and clear, crisp detail, with no removals, repairs or alterations, make this an especially attractive offering. 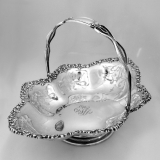 American sterling silver swing handle cake basket by William B. Durgin oc Concord New Hampshire, c.1900. This ornate, pierced body basket has an applied border of ornate shell and scroll work designs and an open work swing handle. The handle is securely attached to the body and stays upright. The oval body sits on a circular, stepped pedestal base. with the basket being 12 1/2" long, 9" wide, *" to the top of the handle, 3 1/2" deep and weighing 593 grams or 19.1 ozs. Troy. The center of the body has an ornate, period monogram EGW. Monogrammed as described above, the soft, warm, original antique finish is present, with no buffing or machine polishing. The excellent original condition and clear, crisp detail, with no removals, repairs or alterations, make this an especially attractive offering. Portuguese 916 standard silver covered sauce tureen with a strap handled liner and 2 ladles by Mergulhao of Lisbon, c.1940. This elegant, large tureen has a rosewood handle, with the lid having a Gadroon circular handle secured to a matching mounting plate. The lid is reversible, so that the matching ladles can be used in either direction. The close fitting 916 silver liner has a riveted strap handle and two deep pockets for your favorite sauces or, the tureen can be used without the liner to take advantage of its large capacity. This substantial tureen is 10" tall, to the top of the handle, 9 1/2" long, 7 1/4" wide, 12 5/8" across the handle and weighs a massive 74.4 ozs. Troy, including the body, liner, lid and 2 matching ladles. The excellent original condition and clear, crisp detail, with no monograms, removals, repairs or alterations, make this an especially attractive offering. The soft, warm, original finish is present, with no buffing or machine polishing. 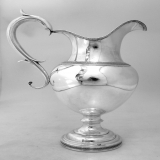 Impressively done in a neoclassical revival style, this regal and substantial coin silver pitcher was flawlessly crafted in Danbury, Connecticut by master silversmiths of Levi Clark, c.1830. He was an apprentice and later partner of John Starr Blackman and this elegant pitcher is a rare example of this makers work. The ample body is complemented by a curving handle and a generous, well formed lip with attractive pedestal and decorative border embellishment. The graceful handle is solidly formed and securely mounted to the body with no repairs or modifications. The pedestal base is beautifully formed and rests completely flat. It stands 13" tall, measures 9" from handle to spout and weighs 937 grams or 30.1 ozs Troy. 1830	The remarkable original condition and clear, crisp detail, with no monograms, removals, repairs or alterations, make this an especially attractive offering. The soft, warm, original finish is present, with no buffing or machine polishing. Austrian Arts & Crafts style square tray with gorgeous Repousse and openwork foliate corners. It measures 7 7/8" long and weighs 260 grams or 8.4 ozs Troy. Done in 800 continental silver c.1910. It bears a makers mark of C.W. and a Vienna Assay mark. The remarkable original condition and clear, crisp detail, with no monograms, removals, repairs or alterations, make this an especially attractive offering. The soft, warm, original finish is present, with no buffing or machine polishing. 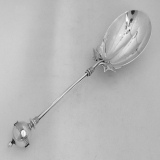 American Aesthetic Period sterling silver serving spoon with elegant, ornamental handle made by Gorham c.1868. The bowl is embellished with applied foliate motif and it is complemented by a gorgeous sceptre style handle. It measures 9 1/4 " in length, and weighs 73 grams or 2.3 Troy ounces. The pristine condition and crisp details, with no monograms, removals, repairs or alterations, make this an especially attractive offering. The soft, warm, original finish is present, with no buffing or machine polishing. 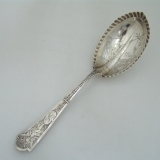 Onslow is one of the most admired and oldest known sterling patterns. It elvolved into itâ€²s current form in the 1760â€²s. It was made as late as the 1900â€²s by Tuttle for U.S. president, Calivin Coolidge. There is only one complete set known to exist and it dates to the Regency period. This elegant ladle is one of the earliest examples of the beautiful pattern and was made in London, c. 1760. The bowl has a delicate gold vermeil interior and scallped edge. The handle has the distinctive and unique scroll design. It measures 6 1/2" in length and weighs 40 grams or 1.28 ounces Troy. The excellent original condition and clear, crisp detail, with no monograms, removals, repairs or alterations, make this an especially attractive offering. The soft, warm, original finish is present, with no buffing or machine polishing. This regal two hundred ten year old tea set was expertly crafted during the Georgian Period by Robert, David & Sammuel Hennell Silversmiths of London, c. 1801. 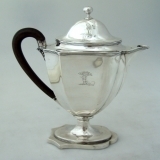 They were a great and reknown family of brilliant silversmiths with a huge influence on British sterling that began in 1736 and continued till 1900. These impressive peices are superbly done in stately Georgian style. The graceful spout and handles are beautiful, solidly formed, and securely mounted with no repairs. The domed lid features a lovely ebonized finial. Each piece bears a handsome engraving of a hunting hound and a tree. The entire magnificent trio has a combined weight of 1149 grams or 36.95 Troy ounces. Tea pot is 7" tall Sugar bowl is 4" tall Cream pitcher is 4 7/8" tall The excellent original condition and clear, crisp detail, with no monograms, removals, repairs or alterations, make this an especially attractive offering. The soft, warm, original finish is present, with no buffing or machine polishing. 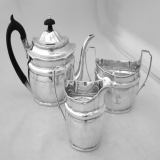 There is a coffee pot made by Henry Chawner that matches this set also available. 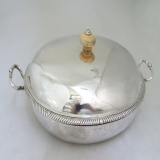 Two hundred and forty-five year old British sterling silver lidded serving dish by John Robinson, having a full set of London Hallmarks for 1766. 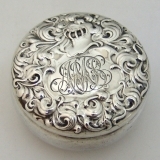 It features an ivory finial on itâ€²s heavy domed lid which has an ostrich crest engraved on it near the finial. It is complemented by handsome applied handles and a gorgeous Gadroon border around itâ€²s substantial lower portionâ€²s edge. This exquisite serving dish is 12 3/4 from handle to handle, and 8 1/4" not including the handles. It weighs 1073 grams or 34.5 troy ounces. The excellent original condition and clear, crisp detail, with no removals, repairs or alterations, make this an especially attractive offering. The soft, warm, original finish is present, with no buffing or machine polishing. 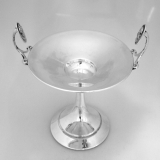 American sterling silver company Dominick and Haff of New York was founded after the Civil War in 1868 and made very high end sterling holloware and flatware until they became part of Reed & Barton in 1928. This chrysanthemem compote crafted in c.1896 is a stunning and magnificent example of their impressive work. It features an exquisite applied chrysanthemum border on the the upper bowl as well as the unweighted pedestal base. It stands 4 5/8" in height, 10" in diameter and weighs 817 grams or 26.3 ozs Troy. The excellent original condition and crisp detail, with no monograms, removals, repairs or alterations, make this an especially attractive offering. The soft, warm, original finish is present, with no buffing or machine polishing. 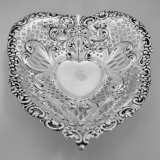 Large American sterling silver heart shaped openwork bowl, masterfully crafted by Gorham Silversmiths of Providence, Rhode Island c.1956. This famous silvermaker was known for expert craftsmanship and brilliant silversmiths who created pieces of enduring art and beauty. This gorgeous example of their style features elegant openwork throughout, complemented by an exquisite scroll and floral motif. It stands on an openwork pedestal with feet. It measures an impressive 9 3/4" length, 8 1/4" width, and weighs 294 grams or 9.5 ozs Troy. It is mongrammed wit an "S" in the center and 1956 is inscibed on the back. The exceptional original condition and clear, crisp detail, with no monograms, removals, repairs or alterations, make this an especially attractive offering. The soft, warm, original finish is present, with no buffing or machine polishing. 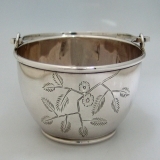 Charming Aesthetic period sterling silver sugar basket with decoratively engraved cherry blossoms. Made by Gorham of Providence, Rhode Island c.1882, this little sugar bowl with itâ€²s delicate swinging handle, is a superb example of the style Europe was enchanted by and described as Japonaiserie. After an American and Japanese trade treaty was signed in 1858, Japanese motifs began to significantly influence western art and designs of the American and European Aesthetic period. It has a 4 1/8" diameter, measures 2 1/8" in deep, stands 5" tall with the handle extended and weighs a substantial 124 grams or 4 ozs Troy. The excellent original condition and clear, crisp detail, with no monograms, removals, repairs or alterations, make this an especially attractive offering. The soft, warm, original finish is present, with no buffing or machine polishing. 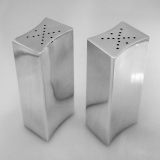 These sleek modernist salt and pepper shakers were crafted by American master silver smith, Allan Adler, who apprenticed for the famous silversmith, Porter Blanchard. They were were made c.1950 when Allan Adler was at the peak of his hollywood glamour. His style is reknown for the clean lines which can be seen in this elegant set. This is an artistic modern interpretation of a familiar item combined with inspired design. Each shaker stands 3" tall; 1 1/2" wide and they weigh a combined 144 grams or 4.6 ozs Troy ounces. The excellent original condition and clear, crisp detail, with no monograms, removals, repairs or alterations, make this an especially attractive offering. The soft, warm, original finish is present, with no buffing or machine polishing. Splendid, and dazzling fish serving knife. Exquisitely hand crafted from mother of pearl and sterling silver, c.1870. This breathtaking server is a visual delight. The entire piece is brilliant and light reflective. 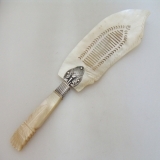 Each portion is done in a large solid piece carved from mother of pearl. The detailed openwork designs, like ocean waves on a horizon, are simple and complement the delicate shape of the carved blade. Magnificent iridescent Mother of pearl, harvested from the interior of a mollusk from the sea, is such an appropriate server for fish. The superb sterling embellishment which attaches the upper and lower portions is done with a graceful triple lotus motif. The handle mimics papyrus wrapping. Both the lotus, and papyrus are water plants. There appears a water theme in every aspect of this piece and nothing detracts from the natural beauty of the organic components. This impressive server measures 11" in length. The excellent original condition and clear detail, with no removals, repairs or alterations, make this an especially attractive offering. 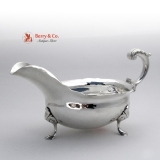 Colonial period inspired gravy boat by master silversmith, William DeMatteo. It is sculptural and classical in shape, superbly complemented by it′s lovely scroll handle with applied foliate embellishment and elegant figural rams feet. Beautifully handwrought c.1940 in Alexandria Virginia. This exceptional piece is as useful and attractive today as when it was crafted. It weighs a substantial 343 grams or 11 Troy ounces and measures 8 1/4" inches, in length and 4 1/8" wide. The pristine condition and crisp detail, with no monograms, removals, repairs or alterations, make this an especially attractive offering. The soft, warm, original finish is present, with no buffing or machine polishing. 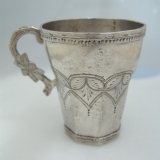 Antique silver cup made of melted Spanish silver coins, minted from silver mined in the Spanish colonies of Mexico or South America, c. 1820. It features lovely engraved decorative borders and an applied handle. It stands 4 1/8" in height, 4 3/4" across the handle and weighs 235 grams or 7.55 Troy ounces. The excellent original condition and clear, crisp detail, with no monograms, removals, repairs or alterations, make this an especially attractive offering. The soft, warm, original antique finish is present, with no buffing or machine polishing. 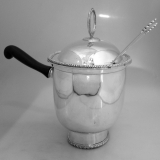 American Aesthetic Period sterling silver cream ladle with elegant, ornamental handle and figural ice bucket bowl made by George Sharp, c.1865. 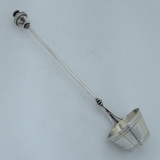 The charming ice bucket ladle is embellished with gracefully engraved borders and complemented by a gorgeous sceptre style handle topped by a superbly cast finial. 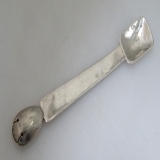 This exquisite serving piece is 8 1/4" long and weighs 38 grams or 1.22 Troy ounces. The pristine condition and crisp details, with no removals, repairs or alterations, make this an especially attractive offering. The soft, warm, original finish is present, with no buffing or machine polishing. 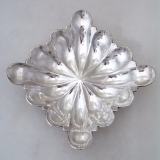 This scarce and desirable Hungarian square serving dish is hand wrought in 800 silver and it reflects light beautifully. Itâ€²s gorgeous hand hammered finish is stunning. The unique fluted is design is superb and expertly crafted. It stands on four handsome ball feet. It measures 10 1/4" in length and weighs an impressive 553 grams or 17.78 Troy ounces and bears the Hungarian assay mark used from 1937 until WWII. The excellent original condition and clear, crisp detail, with no monograms, removals, repairs or alterations, make this an especially attractive offering. The soft, warm, original antique finish is present, with no buffing or machine polishing. 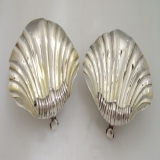 Shell Open Salts Charles Thomas Fox 1829 Pair London Sterling Silver. British sterling silver salt dishes done in a magnificent figural sea shell motif, made by Charles Thomas Fox having a full set of London Hallmarks for 1829. Crested, on the underside, next to the Hallmarks, Manus Justa Decus with an armored raised fist haolding an arrow, each shell measures 4" in length and width and they weigh a combined 181 grams or 5.8 Troy ounces. The excellent original condition and clear, crisp detail, with no removals, repairs or alterations, make this an especially attractive offering. The soft, warm, original antique finish is present, with no buffing or machine polishing. 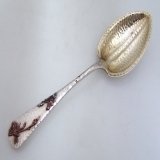 Spectacular engraved brite cut patterns and elegant scalloped edges enhance the bowl of this magnificent Aesthetic Period Cupid pattern spoon by Albert Coles of New York City, Patented 1878. This large and impressive serving piece was masterfully crafted by silversmiths of Albert Coles, of New York City, and patented in 1878. The handle, in the Cupid pattern, has a delightful image of a cherub, wings extended upward, playing a double flute. He is surrounded with exquisite foliate scrolls and stands above an elegant cartouche with a letter "S" beautifully engraved in a classical manner. It measures 9" in length and weighs 67 grams or 2.15 Troy ounces. The excellent original condition and clear, crisp detail, with no monograms, removals, repairs or alterations, make this an especially attractive offering. The soft, warm, original finish is present, with no buffing or machine polishing. 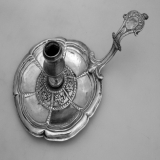 A very nice Spanish Colonial chamberstick dating from the late 16th to the early 17th c, with marks on the handle thumbpiece and the drip pan. This special chamberstick shows signs of wear and old repairs. What wouldn′t, after over 300 years of service. It would seem that it is ready for yet another 300. The chamberstick is 8 1/2" across the handle, 5 1/4" in diameter (pan) and 2 1/2" tall, weighing 165 grams or 5.3 ozs. Troy. 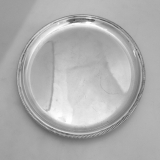 Italian 800 silver circular tray with a handsome, applied Gadroon border by A. Calderoni of Milan, Italy, c.1950. 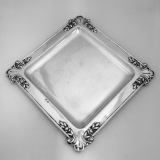 This useful and attractive tray is 10" in diameter and weighs a substantial 350 grams or 11.3 ozs. Troy. The excellent original condition and clear, crisp detail, with no monograms, removals, repairs or alterations, make this an especially attractive offering. The soft, warm, original antique finish is present, with no buffing or machine polishing. 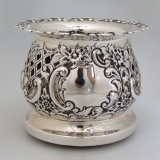 American sterling silver match safe by Whiting, of Massachusettes, with gorgeous repousse scoll motif done in one of their most stunning and oldest patterns, "Heraldic" c.1880. It measures 2 3/8" in length, 1 3/8" in width and weighs 31 grams or 1 Troy ounce. The exceptional original condition and clear, crisp detail, with no monograms, removals, repairs or alterations, make this an especially attractive offering. The soft, warm, original finish is present, with no buffing or machine polishing. 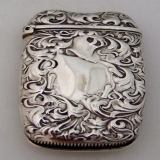 American sterling silver pill box by Whiting, of Massachusettes, with gorgeous repousse scoll motif done in one of their most stunning and oldest patterns, "Heraldic", c.1880. It has a lovely gold vermeil interior. The small round Box has a diameter of 1 7/8" and stands 1" high. It weighs 40 grams or 1.28 Troy ounces. It is monogrammed "AMB" The exceptional original condition and clear, crisp detail, with no repairs or alterations, make this an especially attractive offering. The soft, warm, original finish is present, with no buffing or machine polishing.